Get two DVD workshops and one book full of advice to help you practice your techniques, plus get a two ounce sample of fiber to practice even more! Are you ready to hone your spinning skills? 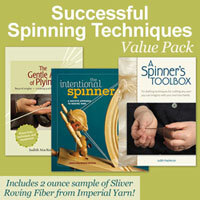 Master teacher Judith MacKenzie has some of the best advice for spinning, from start to finish, and we are offering that to you in this ultimate collection. Learn six drafting techniques that will have you spinning just the yarn you want. Discover a variety of plying techniques to take your handspun yarn beyond singles. Plus, get a variety of tips and techniques for washing, preparing, and finishing yarns. With over 4 hours and 140 pages of advice at one low price, this value pack of information can’t be beat. As a spinner, your most important, versatile tools are your own skilled hands. With those eight fingers and two opposable thumbs, plus a half-dozen simple techniques for manipulating the fiber supply, you can spin a full suite of yarn styles. You’ll begin by seeing the unlikely possibility of spinning the six different yarns styles with a single fiber preparation. You’ll end by witnessing this revered master spinner, in a miracle of energetic ambidexterity, draft two fiber sources simultaneously into a single strong, lofty, funky novelty yarn. And so can you. And several dozen additional intriguing side trips that will spur your creativity and make you a better spinner. The Intentional Spinner with DVD is a compendium of spinning wisdom, with a fun blend of technical knowledge, history, tips, and gently opinionated narrative. 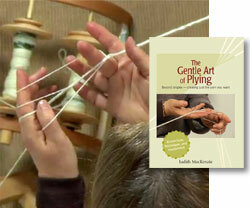 Yarnmaking is approached in three fundamental areas—understanding fibers, managing yarn structure, and practical uses. The Intentional Spinner with DVD includes four projects that demonstrate how handspun can be used in weaving and knitting. 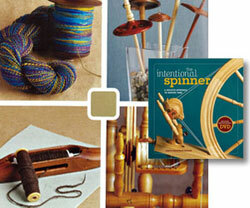 The enclosed DVD features detailed information on yarn diameter, plying, novelty yarn structures, and finshing. Blending technical expertise and fascinating lore, The Intentional Spinner with DVD is a must-have reference for ever spinner. This unique fiber from Oregon based Imperial Stock Ranch adds texture, warmth, and decorative detail to any project. For hanspinners, this sliver results in a finished yarn with more “character” than yarns spun from combed top. If you enjoy this sample, Imperial Stock Ranch has a wide range of colors to choose from as well as full project kits available for purchase. *Color of fiber will range due to stock. 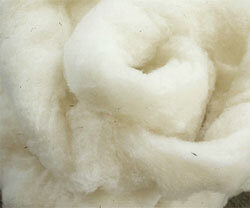 All fiber comes in a beautiful neutral color varying from light to dark.